Fender Hot Rod DeVille™ 212 IV, Black Spedito Gratis !!! The Hot Rod DeVille 212 IV includes a pair of 12" Celestion® A-Type speakers, which provide powerful, well-balanced output with smooth highs, laid-back midrange and full, round lows. The modified preamp circuitry improves overdriven note definition, so you'll have sonic clarity no matter how hard you push this amp. L'amplificatore è in condizioni pari al nuovo, mai uscito dallo studio. Il cabinet non ha un graffio. Invio foto dei particolari a chi è interessato. Non permuto, devo sfoltire il setup. Altre caratteristiche sul sito Fender. Anche il reverbero è stato modificato per avere un suono ancora più caldo e dolce. In the heart, in the head, in the air. In what you think. In your strongest and most sincere passions. Verstärkertyp: Röhrenverstärker. Ständer / Stative. 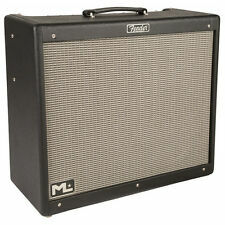 FENDER Hot Rod DeVille ML 212. KEYS & PIANOKeyboards - Zubehör. Snares / Toms / Pads. Practice / Sample Pads. Serie: Hot Rod. Anzahl der Kanäle: 2. Gehäuse aus massiver leichter Kiefer. - 2 Klinkeneingänge - Eingang 2 mit -6 dB. - Hot Rod Serie. - Gewicht: 25,06 kg. - 3 Kanäle: Normal, Drive und More Drive. - Chicken Head Style Knöpfe. Recinto de pino ligero Incluye pedal de 2 botones y funda. Reverb de muelles modificada para mayor suavidad. Circuito de preamplificador modificado para una mayor definición de notas saturadas. Dos altavoces Celestion 12 de tipo A. Le Hot Rod DeVille 212 IV est équipé de haut-parleurs 12" Celestion A-Type avec des aigus veloutés, des médiums apaisés et des basses rondes et pleines. 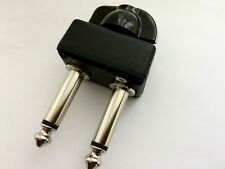 Amplificateur pour guitare électrique tout lampes (3x 12AX7, 2x 6L6). The Fender Hot Rod DeVille 212 III LTD Red October tube combo amplifier gives you classic Fender tone with a blazing-hot red and black look and premium Eminence speakers! You’ll love the glistening clean sounds you coax from the Hot Rod DeVille 212 III. Blues Deluxe. No modifications to the amp are necessary, the module simply plugs into the top of the amp as shown in the. to go from nothing to too loud in a fraction of a turn. This module is also very useful at gigs as it adds an overall. Fresh service and tubes, rebiased for the new power tubes. All tubes are all new Tungsols. Power tubes are 7581a's instead of 6l6gc to increase headroom. Amp has been modded to sound more like a Fender Blackface. Blackface style black and silver grille cloth. Mixer Type Black textured vinyl covering. Amplifier Type: Tube. Effects loop, bright switch and Fender spring reverb. Bridge Pick-Up:with Coil Tap. Amplifier Watts: 60W. This classy looking amp is ready to make your performances a thing of legendary stature! Hot Rod DeVille 410 III. Electric Guitar Combo Amplifier. Includes: guitar combo amplifier (footswitch, cover, and manual not included). See how this sounds with Humbuckers60 watts into four 10” Fender® Special Design Eminence® speakers Three channels (normal, drive, more drive) Effects loop, bright switch and Fender spring reverb Fitted cover and two-button footswitch included. • UPC: 885978479368. • Included Accessories: 2-Button Footswitch, Fitted Amplifier Cover, Owner's Manual. • Color: Black and Silver. Get Your Tube-powered Thrills with This DeVille! 2 x 12 "Celestion G12P-80, 8-ohm speakers. 60-watt tube amp. Spring reverb effect and effects loop (preamp output and power amp input). This ATA case is custom designed to fit the Hot Rod Deville 410. REAL SUPPORT. The best in the industry! Musicians helping Musicians. This ATA case is custom designed to fit the Fender Hot Rod Deville 212. REAL SUPPORT. The best in the industry! Musicians helping Musicians. This kit works for the USA Made Blues Deville. The classic Fender tone is released through these changes. The flabby bottom darkness is gone, what you get is full warm classic tone with nice top end sparkle. This is an easy mod that is nothing more than clipping one wire but the result is amazing. Twin Mod - Fix the mids on the amp and get rid of that flabby bottom. This mod enables you to take all the mids out of the tone allowing more flexibility and versatility. Easy to install. This version tucks nicely underneath the edge of the cabinet for a real clean look. This is the one you want if your doing any mods to your amplifier since you will already have the chassis removed. Unleash the tone of your Hot Rod DeVille. The classic Fender tone is released through these changes. The flabby bottom darkness is gone, what you get is full warm classic tone with nice top end sparkle. This kit is for the USA made versions of the Blues DeVille and Deluxe amplifiers. All the capacitors in this kit were specially chosen for great tone, reliability, and accurate fit in your Blues Deluxe/DeVille. Tube Complement for Fender Blues DeVille JJ/Tesla Brand includes: (1) T-6L6GC-JJ-MP (Apex Matched), which includes: (2) T-6L6GC-JJ (3) T-12AX7-S-JJ . Tung Sol 6L6G is a "Big Bottle" type for the look and sound of 6L6 tubes used during the golden age of hi-fi in the 1940’s and early 1950’s. Rock crushing bass with larger internal plates than competitors. Unleash the tone of your Blues DeVille 2x12 or 4x10 combo. The classic Fender tone is released through these changes. The flabby bottom darkness is gone, what you get is full warm classic tone with nice top end sparkle. Easy to install. Also if you have a black face plate and the lettering has worn off this decal will fix that too. I have 2 versions of this decal available. The standard size lays over the top of the faceplate without having to drop the chassis or remove the back panel. Tube Complement for Fender Fender Hot Rod Deville JJ/Tesla Brand includes: (3) T-12AX7-S-JJ (1) T-6L6GC-JJ-MP (Apex Matched), which includes: (2) T-6L6GC-JJ . The classic Fender tone is released through these changes. The flabby bottom darkness is gone, what you get is full warm classic tone with nice top end sparkle. Complete kit with detailed instruction book with photo's includes all the following mods. Is the tone not what it used to be?. Starting to hum more than it used to?. Is your Deville switching channels all by itself?. Reverb turning on and off?. Maybe you're blowing fuses. Learn how to solder and desolder by pulling and replacing a bunch of components until you get good at it. Primo tube set for 50w amp - matched power amp tubes. PRIMO (higher rated tubes and still good value) tube set. Depending on the style of music you play or enjoy we have a tube set that will fit your needs. Detailed instructions with photos for the Blues DeVille Reissue amplifier. These kits upgrade your amplifier in unique ways and none of the parts are duplicated between the "Recap Kit" and "Complete Kit.". All the capacitors in this kit were specially chosen for great tone, reliability, and accurate fit in your Hot Rod DeVille included in this kit These kits upgrade your amplifier in unique ways and none of the parts are duplicated between the "Recap Kit" and "Complete Kit.". New Replacement Fender Tube Socket Set for HR Deluxe/Deville - FREE SHIPPING! This set includes 5 tube sockets (as shown in the photo). Replace your worn tube sockets and reduce noise, popping, and low. sockets for 6L6 power tubes with long connections to mount to the power board.